Tarps Plus Blog: Tarps Plus Knows Tarps! If you are looking for information about tarps, what the right tarp is for your project then just give the www.Tarpsplus.com agents a call, they will guide you to the right product that will make your projects 100% right. 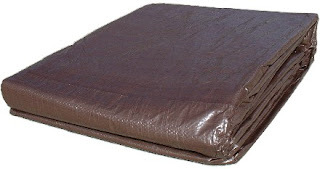 Tarps Plus only sells good quality Tarps, Tarps that will last for years to come and are ready for the heavy duty circumstances. For those who still wait a little mighty fighter in a light duty tarp , the blue poly tarps and brown poly tarps are perfect for temporary projects and for seasonal usage. The Poly Tarps are all water proof and do come in different colors, and mils. If you do not know what you need for the project, don't guess have an agent explain to you why the tarp they choose is the right one for you. All Tarps are also on sale, at ridiculously low prices saving you up to 70% off on your purchase. Go to www.Tarpsplus.com and have the best purchasing experience!. Tarps Plus you guys rock! Thank you for my gift.